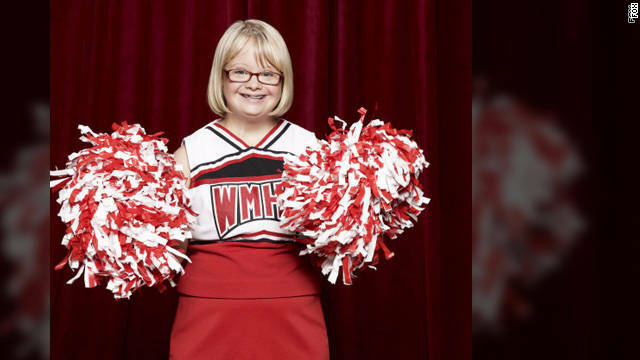 Now actress Lauren Potter, 21, may have another major role. President Obama announced his intent to appoint Potter and Julie Ann Petty, a project trainer who focuses on educating people with intellectual disabilities, as members of the President's Committee for People with Intellectual Disabilities. The President's Committee for People with Intellectual Disabilities provides advice about intellectual disabilities to the president and the secretary of Health and Human Services. This can include education, homeownership and workplace integration issues. This committee consists of 21 citizen members appointed by the president and 13 federal government members who meet periodically over a year and report findings to the president. Potter who has Down syndrome, has routinely spoken about her troubles growing up as a special needs child. "Like so many other kids with special needs, I have been bullied," Potter told People magazine earlier this year. "Kids in elementary school made me eat sand, and those same boys would walk behind me, teasing me. Finally I had enough, and I told them to 'grow up.' "
She graduated from Polytechnic High School in Riverside, California, and she is currently a student at Irvine Valley College. Potter has been involved in several advocacy projects, including serving on an anti-bullying campaign with Abilitypath.org, working with the Special Olympics, Down Syndrome Association and the American Association of People with Disabilities. Does anyone copy edit/proofread these things before they get posted? Hi, do you see a typo? "In a press release statement Obama said,"
Shouldn't there be a comma after "statement"? "In a press release statement, Obama said,..."
@Ian: You don't necessarily need a comma after one prepositional phrase when it is at the beginning of the sentence – different understandings of the rules say you need a comma after a "long" prepositional phrase (more than four or five words) or after two prepositional phrases at the beginning of a sentence. So a comma is not necessary here (allowed, but not necessary). The editors didn't learn about proofreading when they were growing up as a children. What an uplifting story. Ms. Potter is not only hysterically funny on "Glee," she is an inspirational leader in the drama of real life. Great story, but hard to read between the typos! Is there something wrong with her??? Congratulations on your new assignment, Lauren! Looking at your background, I can see that you have been and will continue to be an important member of our society, with a wealth of wisdom for everyone you meet. Lauren has great comedic timing and an ever better sense of self, so she is going to excel at this job, too. Good luck to her! Attempt to regain the youth vote for 2012? Nice. Lump all of us Republicans, who not all of us are rich, greedy and all about money because I for one sure am not. And don't be blaming all of this on us. There are Democrats in DC also who control one of the Houses so shut up and get back to the task of what this article is about. I don't watch Glee, never will because these type of shows have no use to me or my family, however, I am glad that this actress is being recognized and given this task. You go girl! You are one of the highlights of that show...congrats on moving on to even bigger things! The structure of the sentence should not pervade over its content. This is a great initiative and I'm indeed thrilled to see Potter being involved in helping the people in need. You don't know how hard life could be for someone who is intellectually disabled. Thank you Mr. President for the kind, generous and heaven-supported initiatives. You are definitely in for the second term except Americans are ingrates. Didn't they use this same technique with the guy from House? That went nowhere fast, like I'm guessing this will. I'm all for equality and better treatment of the Intellectually Disabled, but really Mr. President, is this a priority right now? Don't you have a doomed-to-hang debt commission, an openly hostile Islamist government threatening to build nukes, double-digit unemployment, and a failed war in a desolate wasteland to worry about? There are a million things we CAN do for people, but resources aren't created by the Federal Reserve injecting fake money into the economy – they are LIMITED, and the first lesson of politics is setting priorities. Priority?That may be right in those days the dinosaur walked the earth and for those who have not evolved since then. Wellcome to the age of multiple tasking. This President can juggle multiple tasks at a time, you'll find him attending dinner and catching terrorists all in a swap. With so much mess inherited and little time, we couldn't have been so lucky to have had this President in office meanwhile it is apparent you have not managed to keep up, those worrysome points that you raised are being duly dealt with!! Now let's give the president a hand on yet another positive decision! I would rather teach a classroom of students with Down's Syndrome than a class full of students who don't want to be in school. Our whole family loves Glee and Becky is hilarious. Congrats to Lauren on her achievements. Good for her, but I dislike it when people say what she said at the end: “The possibilities are endless for anyone and that is what I hope to help bring to this committee – a real life example that with a supportive community and an encouraging country we all can live the American dream!” Not to be all "bah humbug," but for most people, the possibilities are limited by factors beyond our control. It's great to have people like Lauren in the public eye and participating in policy discussions. Those who are not lucky enough to have a person with Downs Syndrome in their family rarely have an accurate view of what the condition does and does not mean. It is possible that a new battery of prenatal tests may mean that we will be a nation without Downs kids and adults. I would never question the right of a family decide if they did or did not have the emotional and financial resources to welcome a Downs baby into their family. But it would be nice to know that more people were making that decision with the best possible information. And it would be nice if we as a nation concluded that giving our Downs friends and neighbors a little extra help was a good investment. Lauren is helping on both fronts. You go, girl! Uh they are sweetie. Collectively they are called The House of Representatives. Lauren is a very positive and bright young lady. Wishing her the best!! Help me by checking out my audition! It's really awesome that Lauren has this opportunity to represent people with disabilities. She is the main reason why I watch Glee and I am sure she will be excellent in her endeavours to work with the President. She serves as a role model to many Americans, with or without disabilities. You go, Lauren!